When the Pahlavi monarchy was approaching its final days in power in Iran, I was playing with Cabbage Patch Kids dolls in Cupertino, Calif., and thought that my friends' parents who worked for Apple ran an orchard. The diaspora community of Iranians around me talked politics incessantly, and I remember hearing vastly varied things about the Shah of Iran, who lost power in the 1979 revolution. Some of my relatives credited him with great feats, like transforming Tehran into a modern city; one elderly great-aunt kept a portrait of him and his wife, the Empress Farah, on her bedside table. Others called him a torturer, and avoided the Iranian man at the neighborhood pool with the Shah's face tattooed on his shoulder. He was a former agent of the SAVAK, the Shah's dreaded secret service, and he seemed to inspire a shadow of terror even in the California sunshine. 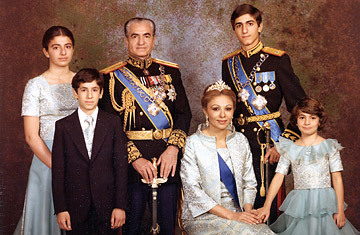 I grew up to study political science and work in Iran as a reporter, and managed to develop an adult understanding of the Pahlavi family's role in Iranian history. But that mature knowledge coexists with all the associations I absorbed as a child. Like so many Iranians, I find my feelings toward the Pahlavis a complex jumble of personal dreams and resentments, and the intensity of my emotions reminds me that they have as much to do with my past, my family and my relationship to history as the royal family itself. The tragic suicide of Alireza Pahlavi, the Shah's youngest son, this week in Boston has stoked great feeling among Iranians everywhere. When I first heard the news, I felt an enormous sadness for Farah, who has endured more piercing losses in the course of a lifetime than most people could bear. The death of her by-then-exiled husband from cancer, the 2001 suicide of her daughter Leila and now the death of her youngest son. True, I had been feeling rather disappointed in Farah until that moment. She was all over the film Valentino: The Last Emperor, which I'd recently seen, and I couldn't help but wish that instead of just mingling with the fashion glitterati of Europe, she would engage in thoughtful charity and be terribly glamorous  like Queen Rania of Jordan. I later wondered why I felt so strongly about how Farah, 72, occupied herself in her elderly Parisian exile. Did it matter much to anyone, let alone Iran? I realized that part of why I cared so much was that she remained the lone figure in the Iranian First Lady department of my mind. We know next to nothing about the wives of the mullahs. Mrs. Khatami, Mrs. Ahmadinejad  who knows what they even look like, let alone how they spend their time and what they contribute to Iran? The clerical government of Iran denies Iranians a First Family to grow up with  to admire, to envy, to criticize. We are left to feel our place acutely as outsiders to the clannish, insular fiefdom of the ruling mullahs, undeserving as citizens of even knowing their wives and children. Perhaps that is why I continue to hold Farah and her family to such high standards. They continue to be the First Family of my imagination, a reflection of my fierce wish to be a part of what happens to Iran, to feel included in a country that no longer has a place for people like me. My expectations of them are oversize, and my anger toward them is studded with grievances against the Islamic Republic, as though the family members are to blame for the three decades of often brutal misrule that followed them. Iranians these days cannot vent their political opinions in newspapers or on television, so they use the Internet as a forum to say all the things they so urgently need to express about their plight. Reading the posts of young Iranians on Facebook and on the BBC Persian service's website after the news of the suicide came out, I was struck by how so many young people who weren't even born during the Pahlavi era were roused by Alireza's death. Many expressed their sympathy in messages that were remarkable for their emotional and political maturity; they reminded me that living under dictatorship can make young people as wise as 40-year-olds in first-world democracies. Many were incensed that anyone might feel sympathy for a Pahlavi. These are the angry Iranians who have given up on the mullahs entirely, for the prospect of meaningful, peaceful change seems a chimerical notion, inconceivable for their generation. Their despair  over lives disfigured by economic blight, in which simple dreams like finding a job or getting married seem permanently out of reach  is so easily channeled into fury with the Pahlavis. It is as though they want to scream at them with the bitterness of children accusing a parent, "You let us down, you fumbled, it is all your fault." It is almost a familial dysfunction: so many Iranians rushing like angry relatives at the chance to lay their anger at Iran's fate at the feet of the Pahlavis, whose failure turned Iran over to the mullahs. Decades after the fall of the Shah, the clan remains a politically acceptable target for so many painful feelings. The family remains of great emotional relevance to Iranians. The Pahlavis themselves know that they stand no chance of being reinserted into Iran politically, though they must more than suspect that their moments of personal grief will be reflected in monumental ways on the larger stage of the Iranian political imagination. Indeed, the initial statement by older brother Reza on his website starkly attributed Alireza's suicide to the younger man's despair over Iran  an all-too-blatant political stance that only opened the family up to criticism. Certainly, the shattering fall of his father and the dislocation of exile contributed to Alireza's depression and pain. But just as surely, any suicide in a depressed person arises when such anguish combines with intimate factors from that individual's genealogy, biochemistry and medical history. But the family changed tack. On Wednesday afternoon, I heard Reza speaking bravely and honestly about his brother's battle with depression in television interviews. I felt an immense relief. His comments were nuanced and candid. They broke the Iranian cultural taboo against acknowledging mental illness, and underscored a point most Iranians everywhere can relate to: families suffer when they are torn apart. Thirty years after the Shah's fall, the Pahlavis are no longer anyone's enemy, and in their grief lies an opportunity to reach out across all those lines that divide.